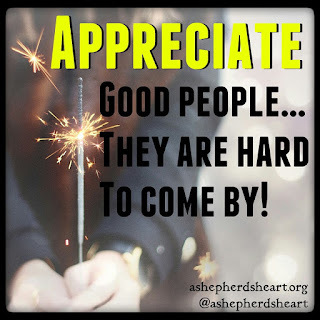 A Shepherd's Heart: 2-4-6-8 Who Do We Appreciate!? 2-4-6-8 Who Do We Appreciate!? I remember the childhood appreciation shout that went...2-4-6-8 who do we appreciate!? APPRECIATION. It seems to be a dying quality sometimes in an often negative world / environment. 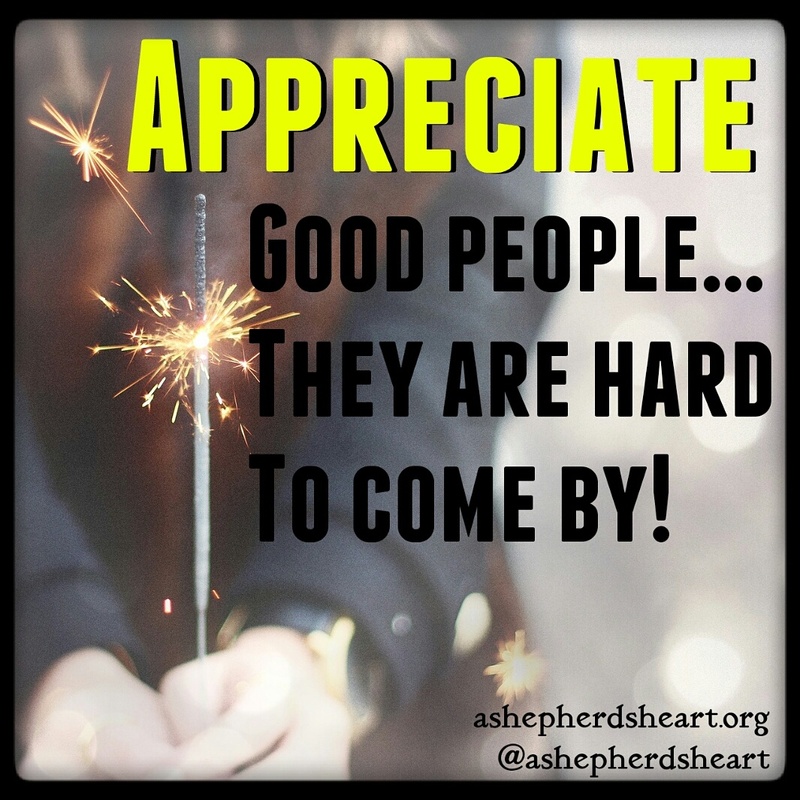 The truth is that taking time to appreciate the people who God has placed in our lives is so important! Whether it's a loved one, friend or coworker, we need to take time to simply appreciate...people. A kind word of thanks or words of encouragement or affirmation can speak volumes to the receiver! It doesn't Matter what personality type you think you are or whether you are a "people person" or not or even if you've never received appreciation or not, while these things may be tough and make it more challenging for us, you and I need to appreciate, value and even cherish the people around us... Especially true of the good people...because sometimes they can really be hard to to come by in this life...however you and I should be part of the "good people" category as we have the strength of, power of, wisdom of and relationship with The One who gave us life! Jesus Himself! So.... Let's regularly do this my friend!